What is it like to Nagomi Visit with teenagers? 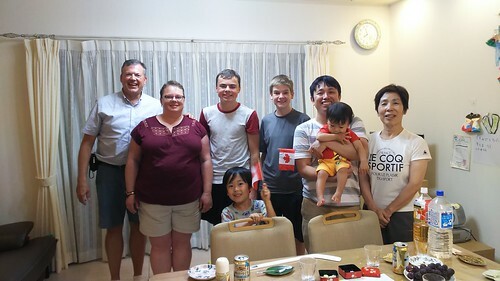 We asked Diana and her family from Canada, along with their son's best friend who were traveling to Japan for the first time. Their son is 15 and in high school, and his best friend is 16. They met one of our hosts in Hyogo Prefecture near Himeji and Kobe who are a family of 4 with a 6 and 1-year-old son. Each Nagomi Visit is unique and this is Diana and her family’s Nagomi experience. How long did it take for your son and his friend to warm up to the host's home and family? If so, how did they interact with the hosts? My son and friend were 16 so they warmed up right away with the host family and played with the little boys. We brought them mini hockey sticks as gifts and showed them how to play hockey with them. Did your son and his friend enjoy any part of the meal the host made? What was the Nagomi experience like as a parent with your son and son's friend? As a parent it was great to see the boys playing with each other even though they didn’t speak the same language. They had a lot of fun. Did having your son and son's friend help foster conversation or help you notice things you may have not if you went with just adults? Having the boys definitely helped us interact with the little boys better. It also gave us lots to talk about, comparing school and activities of the kids. Was participating in a Nagomi Visit different from other travel activities with your son? Was it more relaxing since you are in a home? Or did it make you nervous? It was nice to socialize with a family and was relaxing. We like to travel and it was so nice to experience more than just being a tourist. We were not nervous and it was one of the highlights of our trip, both before and after.